A bottle of safflower oil. Safflower oil is a product of the Safflower plant. Safflower oil is an oil expressed from the seeds of the safflower plant, a member of the sunflower family. This oil began to grow in popularity in the 1960s, and it is widely available in many markets and health food stores. In addition to being used in food production, it also appears as a medium for painting and as a component in a wide variety of commercial products. Like their sunflower relatives, safflowers are annual plants with deep roots that have evolved to sustain the plant in dry climates. Safflowers can be grown in a wide range of climates, although they are vulnerable to frost damage, so they do not thrive in extremely cold regions of the world. The flower heads resemble thistles, developing yellow to orange petals that eventually fall away to reveal the seeds. 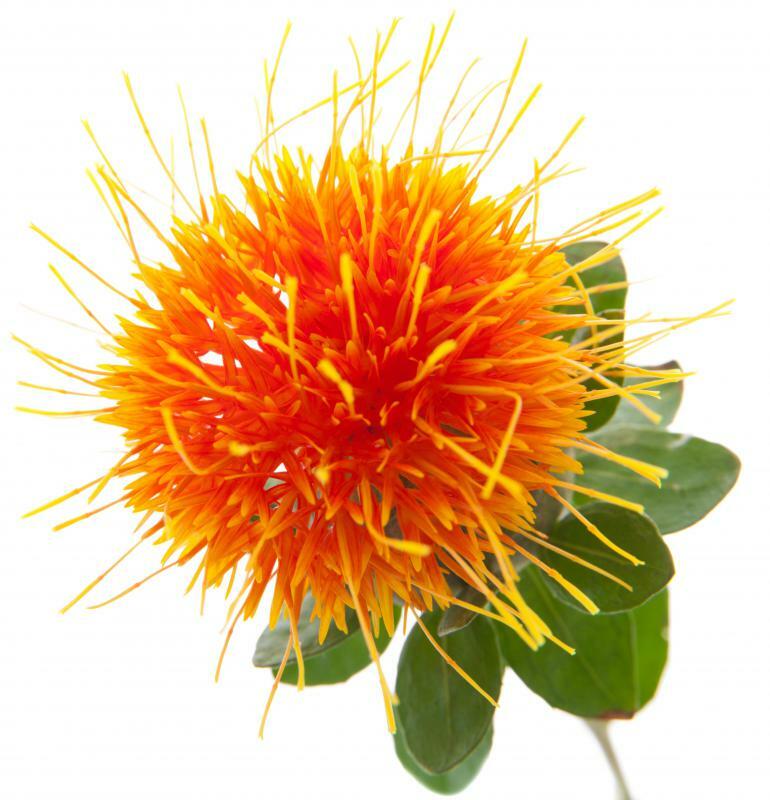 There are two distinct types of safflower oil, each with very different uses. Monounsaturated oil, which is high in oleic acid, is used as a heat-stable cooking oil. Polyunsaturated oil, which is high in linoleic acid, is used as a cold oil. Like other products high in oleic acid, this monounsaturated oil is not terribly beneficial to human health. Polyunsaturated oil, on the other hand, has a great deal of nutritional value, making it an excellent choice for dressings and other applications in which a cold carrier oil can be useful. Monounsaturated safflower oil is very shelf-stable, although it should still be stored in a cool dry place out of the light to prevent it from going rancid. It is odorless and colorless, with a very high smoking point, which means that it can be used for deep frying and other high-heat cooking methods. Polyunsaturated oil, which is also colorless and tasteless, needs to be handled much more carefully, because it goes rancid very easily. It should not be subjected to heat, and some people even recommend storing it in the refrigerator. 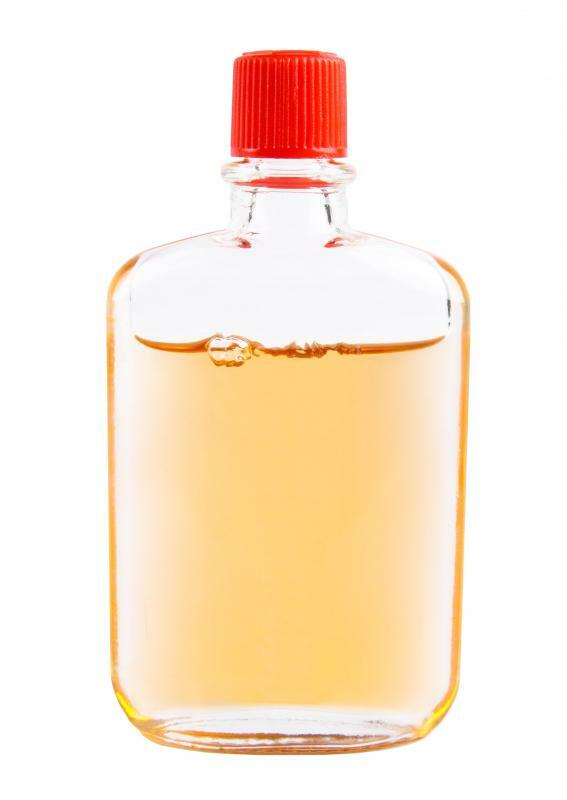 Typically, the labeling on a bottle of safflower oil will indicate which type of oil is inside. If a shopper isn't sure, he or she should check the nutritional labeling on the side, or look at the storage and use recommendations. If the label says that the oil needs to be stored in a cool or refrigerated location, for example, it is probably polyunsaturated, whereas oils touted for their durability in cooking are most likely monounsaturated. Polyunsaturated oil should not be used in high-heat cooking, because it will become rancid, developing chemical compounds that will add an unpleasant taste to the food. How Do I Choose the Best Cooking Oil Suppliers? What Are the Different Types of Cooking Oil? What are the Different Types of Fats? What is the Healthiest Oil to Use for Cooking? @anon134353 post 6: You're getting half the story! Read a metabolic pathway chart for omega 6 then you'll find out they make the body's most powerful anti-inflammatory (PGE1) and vasodilator (prostacyclin), much stronger than omega 3. Understand what the chemicals do. Telling us about carbon atoms and chains is meaningless mumbo jumbo. People want to know what they do. People need to connect the dots. Brian Peskin connects the dots as no one before him has. He's not even a doctor, yet he's lecturing them and nutritionists such as yourself all over the world. He is revolutionizing nutrition but people are obstinate. Like you, he is using science. In fact, his motto is "Science, not opinion". You did not provide all the science. I'm reading now and prefer to believe that butter is a far better option than a vegetable oil based spread! I'm just canvassing opinions. Not all safflower oil is the same. It is now becoming clearer that the type safflower oil that is "similar" chemically to sunflower oil, is associated with cardiac disease. Any oil high in poly fat and omega 6 is not recommended. The only recommended safflower oil is now the kind that is low in poly fats (omega 6) and high in mono fats (omega 3). Monounsaturated fats are preferred over polyunsaturated fats, which in turn are recommended over saturated fats. MUFA(monounsaturated fatty acids) lowers LDL, lowers triglycerides while having no affect on HDL levels but to maintain it. PUFA lowers HDL and LDL level. Low HDL levels weaken your immune system making you susceptible ot infections and at risk for certain cancers. Choose PUFA foods more often than PUFA oils. PUFA oils contain Omega-6 fatty acids that may promote harmful cell inflammation. Safflower oil scores highest in the category of polyunsaturated oils. It is bland, mild flavor and heat stable making them ideal for frying. acid with 4 double bonds. A series of eicosanoids are then formed from arachidonic acid, and these eicosanoids have the overall effect of constricting blood vessels, promote blood clotting, and promoting inflammation. PUFA in the form of Omega-3 fatty acids are found in salmon, sardines, mackerel, canola oil, walnuts, and flax. I studied and teach nutrition. All of this information is science based, so please be careful what you may read in articles. The information each of you provided is somewhat accurate, and I hope this information clarifies some distortion of Polyunsaturated and monounsaturated fats and oils. Also, remember that oils provide flavor and color or none at all depending on the need of the food making proper storage essential for quality of the oil. @cmsmith10: not to put you down but safflower oil compared to plain vegetable oil is better but potato chips use a lot of Safflower oil. Does that make potato chips a healthy source of good fats? @anon98820: again please seek clarity on using saturated fats over poly. You may be surprised at what you find. Also, a TLC (Theraputic Lifestyle Changes)- diet RDs use as nutrition intervention in the reduction of cardiac risk suggest that sat. fat should be less than 7 percent of total kcal, and poly. fats up to 10 percent of total kcal. Hope this helps! It is generally agreed that monounsaturates are good, but opinion is sharply divided on polyunsaturates. Obviously the main health authorities etc. currently tout it as beneficial, but others, such as Barry Groves, quote evidence that it lowers our immune system. I personally would rather use saturated fat than polyun. This article is an OK summary of the benefits of Safflower Oil. But it neglected to mention that people to need to get the proper dosing amounts of Safflower Oil for it to be effective. @cmsmith10: I agree with you on the benefits of safflower oil. It is all I use to cook with. Safflower seed and oil is one of the best sources of Omega 6. This breaks down the hard fats like animal fat. At the same time, it provides us with the fat that we need. As a seed, safflower contains tons of fiber, minerals, and vitamins. They are full of Vitamin B and Vitamin E that acts as an antioxidant. I have read articles that say that they are best eaten raw and not roasted. I don’t know if you know this, but fatty acids go bad pretty quick. Always store your oil in a tight container in a cool, dark place. I know a lot of people reuse oil but that is not a good idea. The heat damages the oil. Seeds should be stored in the refrigerator. fats. Safflower seed and oil are part of the good fats. Monounsaturated fats are good fats. They help to reduce cholesterol and triglycerides, and lower blood pressure. Polyunsaturated fat is also a good fat. This can prevent tumors, aid against infection, help your immune system, and prevent heart attacks. This is your Omega 3 and Omega 6 fats. Safflower oil is an Omega 6 fat. Historically safflower plant and seed was not used for production of oil. This practice started relatively recently, in the second part of the 20th century. I like to use safflower oil in cooking because it does not burn, and does not leave any kind of taste in the mouth.